InVision Homes bring you fresh new ideas for stylish, affordable homes. They specialise in sloping and elevated home sites, town cottages, turnkey house & land packages and investment homes. They have something special to suit every budget, with the old-fashioned family values and integrity they have been known for for over twenty years. 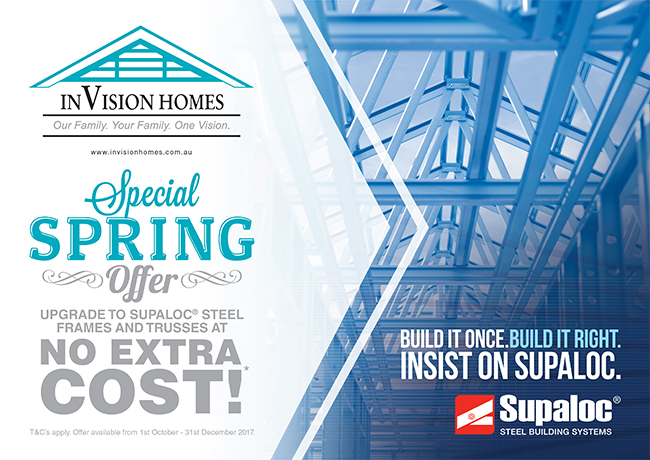 To celebrate the addition of Supaloc steel frames to their building options, this Spring they are offering an upgrade to this amazing quality product at no extra cost. View their website for more information on this incredible offer, or to contact this quality new home builder.